...hugely impressive in the right environment, so much so it makes you want to play those fast-paced games all over again. G-Sync technology on a 27in, 2,560x1,440-resolution monitor makes a lot of sense for gamers who have a high-end video card in their rig. Something like a GeForce GTX 980 Ti or Titan X is able to push healthy framerates in all games, so whilst the 40-60fps is crucial, having a variable refresh rate at higher resolutions leads to even smoother gameplay. This, in a nutshell, is the appeal of the Asus Swift PG279Q. If, for whatever reason, G-Sync is not your cup of tea, the monitor also support ULMB technology at high refresh rates, ostensibly to reduce motion blur. Of course, both can't be used at the same time, which is a limitation of the technology, so you pays your money and makes your choice. Last year's PG278Q had many of the traits of this year's leading gaming-focussed monitor. That screen was let down, rather obviously, by a TN panel whose viewing angles and colour reproduction weren't acceptable for the large financial outlay. Improvements in IPS-type technology have enabled the latest generation of screens to have extremely high refresh rates that are a natural fit for gamers. The PG279Q is a manifestation of such technology. It's hugely impressive in the right environment, so much so it makes you want to play those fast-paced games all over again. The sticking point is the price, obviously, and many will find it difficult to countenance the £699 fee for a 27in, 2,560x1,440 screen. If you can get around or justify the tremendous expense, typically if you have a multi-thousand-pound gaming PC at the ready, we feel there is no better genuine gaming monitor on the market. 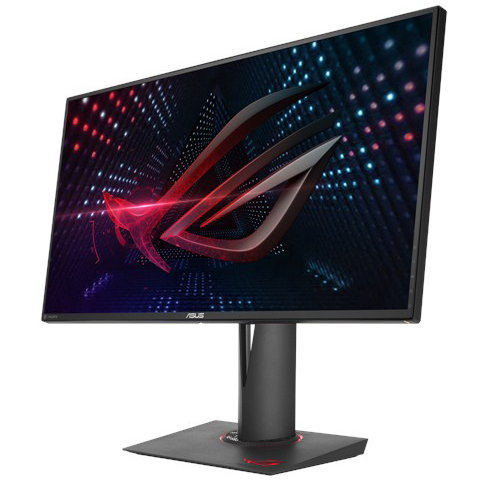 The Asus Swift PG279Q ROG G-Sync monitor is available to purchase from Scan Computers. Tarinder - When you say “…input latency of just 10.2ms, which is well above average for monitors of this type.”, would I be correct in assuming this means better than average (i.e. lower), rather than the 10.2ms being higher than average? Been waiting for this, but at that price.. The wait continues. Does anyone know if this uses an external power-brick like its TN predecessor? Yup, it is better than the average for this type of monitor. Yes, it has an external (though nicely-designed) brick.